Each year the Northern Rockies Fire Science Network (NRFSN) provides the Joint Fire Science Program with a report summarizing its activities and achievements for the year. Membership. 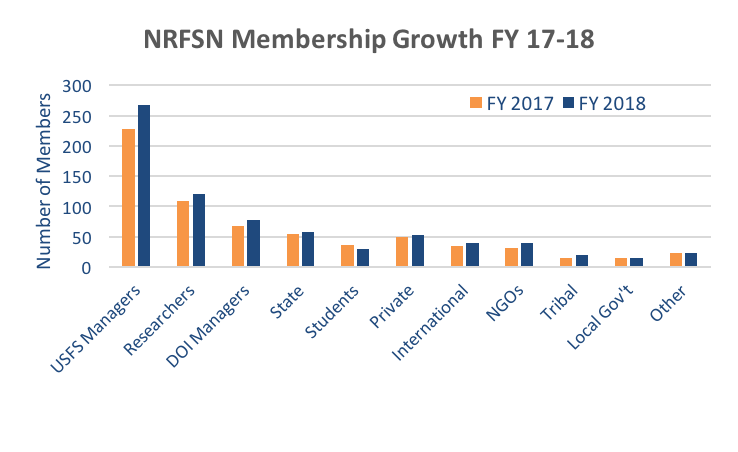 NRFSN membership grew 12% from FY17 to FY18, bringing current membership to 743 (not counting 25 JFSP Fire Science Exchange Network members). Notable increases in membership in FY18 were from tribal (33% growth), NGOs (29%), international (18%), Forest Service managers (17%), and DOI managers (15%) (BIA, BLM, NPS). This growth predominantly stemmed from engagement at the Bureau of Indian Affairs Northwest Regional Fuels Meeting, the Forest Service Northern Regional Fuels Specialist Meeting, the Fire Continuum Conference, and NRFSN field trips. Reflecting the high public and tribal land ownership in the Northern Rockies, the NRFSN has a high proportion of federal, tribal, and state managers (57%) and researchers (16%). Manager membership includes 267 USFS, 58 State, 31 Tribal and BIA, 29 BLM, 28 NPS, 15 local government, and 7 FWS managers. 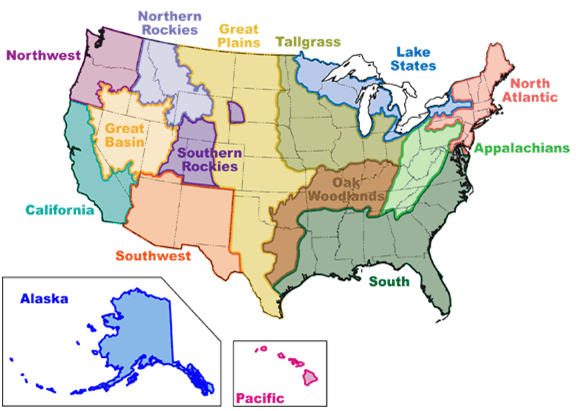 Members are predominantly from ID, MT, OR, WA, WY and Canada. Research membership includes 68 University, 49 USFS, and 4 USGS researchers. FY 2018 Activities. In FY18, the NRFSN continued to gain visibility through co-hosting and attending in-person events, and through personal briefings and consultations. In addition to direct engagement, we produced and facilitated access to online resources, including original written products and videos, expanded our searchable publication and webinar databases, developed new “hot topic” web pages, built past event webpages, and engaged through Twitter. This year, we especially emphasized in-person events, expanding the online searchable databases, and developing “hot topic” web pages. Direct Engagement - Direct engagement is the most rewarding part of NRFSN work because members build relationships and exchange knowledge. This is where we spent the greatest amount of our time, energy, and resources in FY18, facilitating scientist-manager communication through workshops and field trips, engaging the public in fire science conversations stimulated by art, giving presentations and delivering materials through exhibits, and conducting leadership and field briefings and consultations. Workshops and Field Trips. The NRFSN played a substantial role in activities related to the Fire Continuum Conference, which was co-hosted by the International Association of Wildland Fire and the Association for Fire Ecology in Missoula, Montana. In addition to participating on the planning committee, we co-hosted one workshop and two field trips, documented four field trips for the conference proceedings, co-sponsored a fire photography exhibit, and video recorded the conference plenary sessions. More than 600 attendees had a selection of over 400 presentations and workshops, six field trips, and four keynote presentations. Covering the continuum of wildland fire science and management topics, including before, during and after fire, the conference and associated events offered many learning and networking opportunities. We planned other in-person events to address the following topics of high interest in the Northern Rockies: reburns and post-fire regeneration, fuel treatment effects, and whitebark pine restoration. 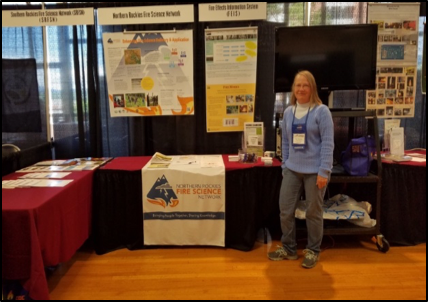 In addition, we partnered with the University of Montana to offer a fire science communication workshop for scientists. With an increase in the frequency and extent of wildfire, post-fire regeneration is a topic of a growing interest to managers and scientists in the Northern Rockies. In FY18, the NRFSN partnered with multiple JFSP-funded research teams to gather information on research needs and disseminate science on these topics through two events: Post-fire Regeneration and Fuels Workshop series, and Long-term Vegetation and Reburn Potential Workshop. First, drawing from a recent publication (Stevens-Rumann et al. 2018. Evidence for declining forest resilience to wildfires under climate change. Ecology Letters (21:2)), the Post-Fire Regeneration and Fuels Workshop series engaged forest managers in co-developing strategies for post-fire tree regeneration and fuels management within the context of adapting to climate change. During Spring 2018, this series included three workshops and focus groups in the Northern Rockies (Missoula, McCall, Boise) and attracted over 150 participants. Workshop presenters from the University of Idaho synthesized science about the implications of a changing climate on post-fire tree regeneration and fuels, drawing upon meta-analysis of observed post-fire tree regeneration, or lack thereof, as influenced by burn severity and climate across 52 fires within mixed-conifer forests of the Northern Rockies. They incorporated tree regeneration data, post-fire fuels data, and projected climate of the next 40 years into strategies co-developed with workshop participants. 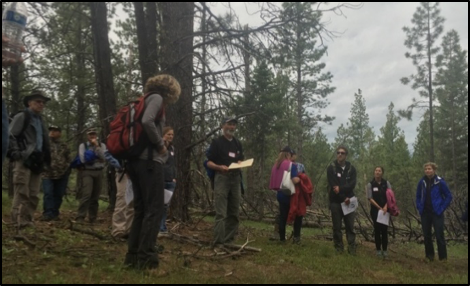 In June 2018, the NRFSN partnered with the University of Idaho, Rocky Mountain Research Station, Pacific Northwest Research Station and the University of Washington to coordinate a Long-term Vegetation and Reburn Potential Workshop and field trip in McCall, Idaho. This event brought local and regional managers and scientists together to share research findings and discuss their implications for vegetation and wildland fire management. 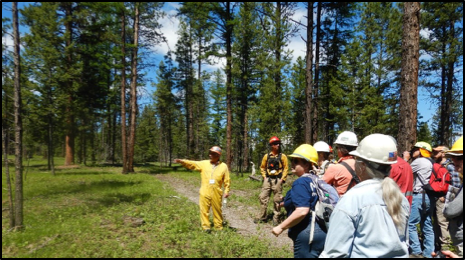 With a field trip to view the extensive 2007 East Zone Complex, the workshop facilitated the exchange of ideas between scientists and managers and encouraged collaboration on developing wildland fire management and post-fire vegetation management strategies. The University of Montana’s Lubrecht Experimental Forest is home to 1 of 13 national Fire-Fire Surrogate (FFS) study sites funded by the Joint Fire Science Program to evaluate the effects of thinning and burning treatments on vegetation, fuels, wildfire potential and behavior, and ecosystem structure and processes in frequently burned, fire-adapted forests. The NRFSN partnered with the University of Montana's W.A. Franke College of Forestry and Conservation, Rocky Mountain Research Station, and Montana Forest and Conservation Experiment Station to engage the original and current researchers to host two field trips to the site: one half-day field trip offered during the Fire Continuum Conference and one full-day field trip later in the month (this field trip was planned in 2017 and postponed twice owing to smoke and then snow). Presenters at the Fuel treatment effects in ponderosa pine and dry mixed conifer forests: 17 Years after the Fire-Fire Surrogate Study field trip discussed short and mid-term treatment effects, including stand dynamics, fuel treatment longevity, potential fire behavior, bark beetle activity, and soil productivity. The field trips attracted local, regional and national managers who witnessed and discussed the effects of burned, thinned, and thinned+burned treatments on a variety of forest characteristics, as well as the impact of a mountain pine beetle outbreak approximately five years after treatment implementation. The NRFSN also partnered with Tall Timbers Research Station, University of Montana, Los Alamos National Lab and the Rocky Mountain Research Station to offer a field trip to an experimental burn at the Lubrecht Experimental Forest during the Fire Continuum Conference. The Lubrecht Experimental Forest was also home to the first Western Rx Fire Science Research Burn, conducted as an extension of the RxCADRE and Prescribed Fire Science Consortium (RxScience) experiments which have been conducted in the Southwest for the past decade. The field trip allowed participants the opportunity to integrate with the operational command structure of the 10-acre prescribed burn. The burn and field trip was designed to offer a unique opportunity for people from a variety of fire experience backgrounds to observe a prescribed burn. Managers and researchers discussed operations, fire effects, fire behavior and fuel characterization methods, among other topics, during the research burn. 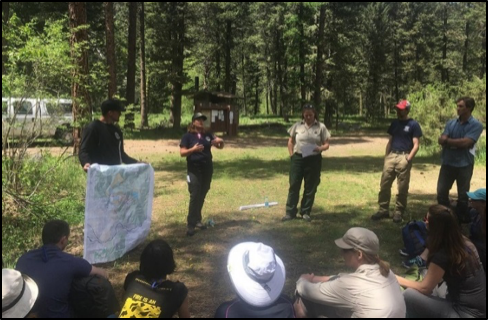 In September 2018, the NRFSN partnered with the Whitebark Pine Ecosystem Foundation and the USDA Forest Service Forest Health Protection, Boise Field Office, to host a workshop, Central Idaho Whitebark Pine: High, Dry and Burned, in Stanley, ID. The workshop featured panel discussions and field trips focused on the unique setting and challenges facing whitebark pine in the central Idaho area. Managers and researchers representing a range of whitebark pine restoration topics presented and participated in the workshop, leading to productive discussion of restoration strategies and management actions in whitebark pine ecosystems. and media. The impressive cadre of instructors included Michael Kodas, Deputy Director, Center for Environmental Journalism, University of Colorado Boulder; Nathan Rott, Reporter at the National Desk of National Public Radio; and Sarah Coefield, Air Quality Specialist, Missoula City-County. Workshop participants practiced crafting a wildfire information message and delivering this message in a mock interview with peer and expert review. Thirty-two people attended, representing a mix of scientists, managers, and communicators. The workshop was well-received. In October 2017, the NRFSN wrapped up our extensive involvement in bringing Paul Hessburg’s Era of Megafires multimedia presentation to several Montana and Idaho locations with a final event in Salmon, Idaho. The Era of Megafires is a multi-media presentation featuring videos from North 40 productions, wildfire photography from John Marshall, and fire ecology discussions with Paul Hessburg, Research Landscape Ecologist for the USFS Pacific Northwest Research Station. The NRFSN assisted with the logistics and advertising at the Salmon event, which engaged 75 audience members. Whereas in FY17, we delivered science about fire and fire management to the public through Paul Hessburg’s Era of Megafires community presentations, in FY18 we experimented with messaging through art. 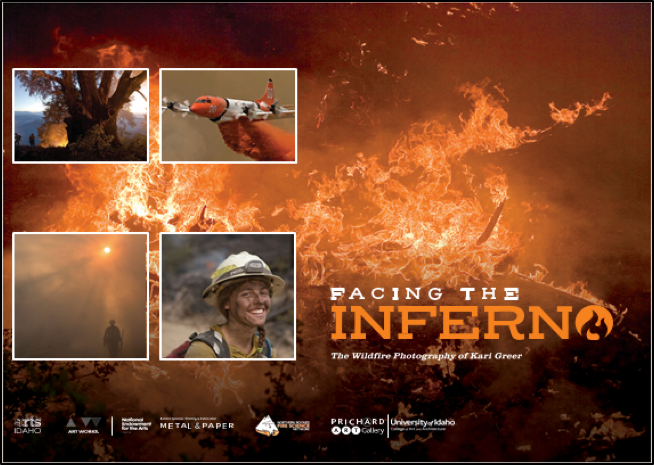 During the Fire Continuum Conference, NRFSN partnered with the University of Idaho to sponsor the presentation of Facing the Inferno, a wildfire photography exhibit featuring the work of Kari Greer. Greer, a former wildland firefighter, specializes in wildfire photography and editorial photojournalism. She works as a photographer with the National Interagency Fire Center in Boise, Idaho. The University of Idaho’s Penny Morgan of the Department of Forest, Rangeland and Fire Science and Kari Greer hosted a reception for the opening of her exhibit, including a discussion and question session about Greer’s moving photography. Presentations and Exhibits. NRFSN talks and briefings in FY18 focused on engaging with interagency fuels and fire behavior specialists, BIA and tribal managers and members, and collaborative groups. Specifically, talks and briefings were given at the Northern Region Forest Service Fuel Specialist meeting (Missoula, Montana), a Salish-Kootenai Forestry Club meeting (Pablo, Montana), a Confederated Salish and Kootenai tribal council meeting (Pablo, Montana), the 2018 Cohesive Strategy Workshop (Reno, Nevada), a NW Bureau of Indian Affairs Regional Fuels meeting (Pendleton, Oregon), the Advanced Fire Environment Learning Unit of the National Wildfire Coordinating Group, and at the 2018 National Association of State Foresters Meeting (Whitefish, Montana). At the Fire Continuum Conference, Vita Wright summarized NRFSN’s FY16 Learning from a Legacy of Wilderness Fire in the Bob Marshall Wilderness Complex workshop discussions in a presentation titled Wilderness Fire Management: Was it Harder Then or Now? In addition, NRFSN materials were distributed at the National Whitebark Pine Summit (Missoula, MT), Montana Forest Collaboration Network Workshop (Missoula, MT), 2017 Society for American Foresters Convention (Albuquerque, New Mexico), 2017 Association for Fire Ecology Congress (Orlando, Florida), and the Idaho Forest Restoration Partnership/Montana Forest Restoration Network Workshop (Coeur d’Alene, Idaho). Webinars. Because there are already many fire and fuels-related webinar series, the NRFSN does not host a regular webinar series. Rather, we host webinars on key topics as requested by scientists and managers. In FY18, we hosted the following webinars: Effects of fuel treatments and previous fires on subsequent fire management costs with Kevin Barnett (University of Montana), and Returning fire to the land: Celebrating traditional knowledge and fire with Frank Lake (Pacific Southwest Research Station). We also served as a liaison and co-sponsored a webinar titled BehavePlus Updates and Changes, which was presented by Faith Ann Heinsch (Rocky Mountain Research Station), with several other western fire science exchanges. Network of Fire Science Champions. In FY18, we hosted seven more workshops and field trips than initially planned. As a result, we did not have the capacity to host Network of Fire Science Champions calls. We plan to resume these in FY19. Briefings and Consultations. In FY18, we continued to take advantage of opportunities for one-on-one briefings and consultations to increase awareness of the NRFSN, share products and services, and explore potential future collaboration or partnerships. We provided personal briefings to the following leaders: Forest Supervisor, Salmon-Challis National Forest; Dean, WA Franke College of Forestry and Conservation, University of Montana; Colville National Forest Fire and Aviation Leadership Team; Colville National Forest Resource Staff Officer; USDA Forest Service Northern Regional Forester; USDA Forest Service Acting Chief of Staff Fire and Aviation Management; Northern Regional Air Quality Specialist; Flathead National Forest’s Swan Lake District Ranger; USDA Forest Service Acting Deputy Chief of State and Private Forestry; National Park Service IMR Chief, Landscape Conservation and Climate Change; Program Manager, Wildland Fire Management RD&A; Montana DNRC Chief of Fire and Aviation Management. 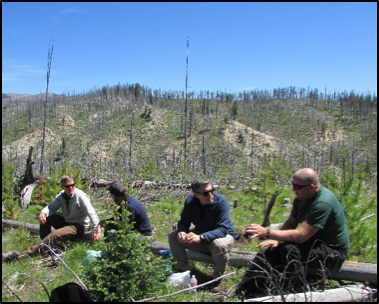 Field consultations were held with an additional nine fire or forest managers and scientists representing the Colville National Forest, Salmon-Challis National Forest, Pacific Northwest Research Station, and the USFS Human Performance & Innovation and Organizational Learning RD&As. In addition to the many in-person events we hosted or co-hosted in FY18, we put substantial energy into increasing the abundance and availability of online resources through the NRFSN website and databases. Past Event Documentation. In FY18, the NRFSN continued to capture and highlight events we’ve hosted through past event web pages that include links to related resources, video recordings, and event summaries. These offer learning opportunities for those who were not able to participate directly. Confederated Salish-Kootenai Tribal Fire and Forestry Management: Philosophy, Management Strategies, and Working across Boundaries. In addition to documenting the Fire Continuum Conference field trips, we recorded conference plenary presentations, which will be made available on the NRFSN YouTube channel, in our webinar/video archive, and on the Association of Fire Ecology website. We also documented presentations at the Long-term Vegetation and Reburn Potential Workshop, as well as all of the presentations at the Central Idaho Whitebark Pine: High, Dry and Burned Workshop. These recordings will be available on their NRFSN respective past event pages, the NRFSN YouTube channel, and in our webinar/video archive. As part of an effort to provide more scientific resources related to the human factors of firefighter safety, in FY18, we developed two past event pages for staff rides in the region: the Cramer Fire Staff Ride and Butte Fire Staff Ride, both on the Salmon-Challis National Forest. Neither staff ride is currently documented in the Wildland Fire Leadership Development Program’s Staff Ride Library. NRFSN staff ride pages aim to provide an overview of the event and link to staff ride videos and documentation as well as relevant scientific resources. As with other past event pages, our intent is to provide resources that support continued learning, including for those who could not participate in the event. Searchable Databases. Because the number of recorded webinars and videos continues to increase, and recordings can be difficult to find, we offer a searchable Webinar & Video Archive. In FY18, we added 209 webinar and video recordings to the NRFSN searchable webinar & video database, including 71 new entries related to the Human Dimensions of Wildland Fire. This topic is internally focused on the human dimensions within the wildland fire organization and is separate from the externally focused Fire Communication and Education topic. Many of these resources are related to human factors of firefighter safety. Overall, we provide access to 652 webinar recordings and videos, which are searchable by topic and ecosystem. According to Google Analytics, there were 793 page views of our Webinar & Video archive database in FY18 (excluding website traffic from NRFSN staff). In FY18, we also expanded the NRFSN Research & Publications Database to 3904 total searchable and filterable documents, with 1070 documents added to the database. We spent substantial effort this year reviewing and revising the organization of the database. With the increasing number of resources available, we added subtopics to help users more easily access relevant resources. Subtopics were added for the following database topics: smoke & air quality, fuel treatment & prescriptions, fuel assessment & monitoring, fire behavior, and risk. Of note, we added a new section to the database focused on Wildlife and Fire. We hope this will entice more wildlife biologists to use the database and other NRFSN resources. According to Google Analytics, the database received 2,352 page views. Hot Topics Webpages. In FY18, we continued to develop “hot topic” webpages that focus on key themes important for fire and fuels management in the Northern Rockies. These topic-focused web pages feature important resources (webinar recordings, videos, scientific articles, reviews, and briefs) relevant to specific issues of interest. While these webpages pull from our existing databases, they are more refined than searches using the web and database filters. These have been reviewed by subject matter experts to ensure they include the most current and relevant resources on a given topic. The following Hot Topic webpages were created and shared with our users in FY18: Aspen Restoration and Management, Big Sagebrush: Fire Ecology and Management, Fire & Traditional Knowledge, Organizational Learning, and Wilderness Fire. Briefs and Syntheses. 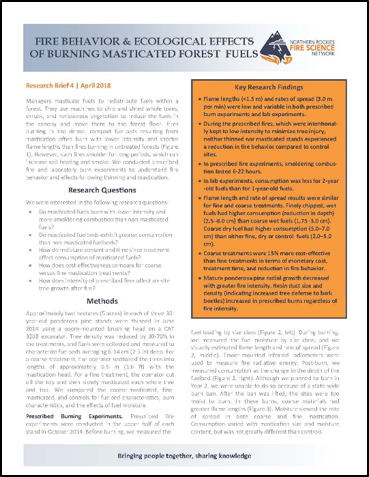 In FY18, the NRFSN produced a second research brief focused on mastication: Fire behavior and ecological effects of burning masticated forest fuels, which summarizes research by Penny Morgan, Alistair Smith, Aaron Sparks, Camille Stevens-Rumann, Pam Sikkink, Zachary Lyon and Robert Keefe. The authors summarize research on prescribed fire and laboratory burn experiments to understand fire behavior and effects following thinning and mastication. They concluded that fires burning in the dense, compact fuelbeds resulting from mastication often burn with lower intensity and shorter flame lengths than fires burning in untreated forests. However, such fires smolder for long periods, which can increase soil heating and smoke. This brief uses graphs, images, and clear language to make the results accessible to managers who use mastication. As part of our effort to provide more resources related to the human factors of firefighter safety, we partnered with Anne Black of the Human Performance and Innovation & Organizational Learning Research, Development, and Application Program to produce a research brief on improving wildland fire radio communications. This research brief summarizes a study looking at the complexities of radio communication and offers lessons learned for more effective training and communication. In FY18, we continued our partnership with the Fire Effects Information System to finalize updates to the Mountain Big Sagebrush (Artemisia tridentata subsp. vaseyana) Species Review. In addition, we revised the debris flow science review we developed in FY17 based on input from the USGS Landslides Hazards Program. Newsletters. We produced 5 bimonthly newsletters outside of fire season. NRFSN newsletters are resource-focused with short articles about new scientific resources and categorized lists of new and relevant publications, upcoming events, etc. Social Media. In FY18, we sent 166 tweets and increased our number of followers by 289. This brought the NRFSN a total of 1484 followers. Our tweets aim to highlight current research and news relevant to fire science and management in the Northern Rockies. We also use Twitter to make our followers aware of NRFSN events and other conferences, webinars, and opportunities that may be of interest, including those hosted by other fire science exchange networks. Videos. We partnered with Grand Teton National Park and Teton Interagency Fire to co-sponsor a 6-minute video about the 2016 Berry Fire. This video communicates the importance of fire in this ecosystem and the challenges of managing large, fast-moving fires in public lands where the dual mission of resource protection and public enjoyment can be challenging to balance. The video intent is to raise public understanding of the role fire plays in western forests and to provide insight into the planning, monitoring, and research managers and scientists undertake to understand, prepare for, and manage fire as a process of change. The video was shared through the NRFSN YouTube channel, and through the Grand Teton National Park Facebook page, where it has had over 74,000 views. An Established Resource in the Northern Rockies. 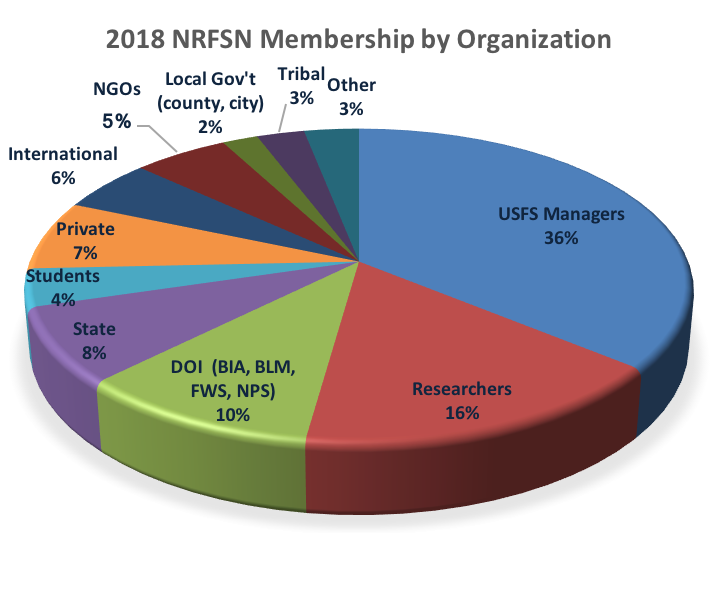 In our sixth year, the NRFSN continued to grow its reach within the fire research and management communities with increasing engagement from both managers and scientists. There is now a high level of awareness about the Northern Rockies Fire Science Network by fire and fuels managers, and we are increasingly being invited to participate in a variety of events in the region. We continue to expand the audiences we serve beyond federal and tribal managers to include state and local managers as well as non-governmental organizations, private landowners, and community members engaged in fire and fuels management. Governance and Staffing. The NRFSN continues to leverage partnerships in leadership with the USDA Forest Service’s Rocky Mountain Research Station – Human Performance and Innovation & Organizational Learning RD&A, the Wildland Fire Management RD&As, RMRS Fire, Fuels, and Smoke Program, and Northern Region; National Park Service Branch of Wildland Fire; University of Idaho, University of Montana, Montana State University, and Salish Kootenai College. In November 2017, NPS Science Communication Specialist Linda Mutch started working with NRFSN, sharing the Coordinator position with Megan Keville, Research Coordinator with the University of Montana Restoration Ecology Lab. In addition, we formalized a shared contract position with the Rocky Mountain Research Station’s Fire, Fuels, and Smoke Program; Pam Sikkink continued to work with NRFSN as Fire and Fuels Science Information Specialist with knowledge and expertise in a variety of fire and fuels research topics. In FY18, she primarily focused on managing and updating our searchable publication and webinar databases as well as providing technical writing and other NRFSN support. In addition, in FY18, we expanded our capacity by partnering with Monique Wynecoop, Fire Ecologist, Colville National Forest and Pacific Northwest Region. We welcome her expertise and enthusiasm for fire ecology, fuels monitoring, and help serving tribal fire and fuels managers. We continue to work closely with the NRFSN Planning Team to design and implement NRFSN activities. In FY18, Jim Riddering, Co-Investigator and Adjunct Associate Professor from the University of Montana’s National Center for Landscape Fire Analysis, who has been involved since the NRFSN planning stage, stepped down from the team. His Co-Investigator role with the University of Montana was filled in May 2018 by Andrew Larson, Associate Professor and Director of the Forest Ecology Lab with the university’s WA Franke College of Forestry & Conservation. Andrew’s research interests are complementary to those of others on the team. He also has cultivated a strong level of engagement with managers in the region and frequently communicates science with a variety of audiences. The NRFSN welcomed three new members to our Advisory Board in FY18, expanding the Board’s representation to include the BLM, BIA, and Montana Department of Natural Resources (DNRC). New members are Chris Barth, Fire Mitigation Specialist for Montana, BLM; Kim Kelly, Zone Fire Ecologist for the Northwest and Rocky Mountain Regions, BIA; and Mike DeGrosky, Chief – Aviation and Fire, Montana DNRC. The NRFSN Advisory Board provides input to the Planning Team on strategic direction, partnership opportunities, and potential activities; networks with their respective communities about NRFSN activities and products; makes suggestions to improve the effectiveness of our activities and products; and provides feedback on program effectiveness. At our FY18 meeting, in anticipation of our FY20-21 renewal proposal, the Board recommended a network-specific needs assessment which will inform future priority topics and activities. We look forward to gathering this information in FY19. FY18 Highlights. FY18 was another extremely productive year for the NRFSN. We leveraged partnerships to host or co-host seven more workshops and field trips than originally planned for the year. In all, we supported 11 workshops and field trips, which is a lot given our long winters, intense fire seasons, and short field seasons where managers and scientists are all trying to squeeze in their field work. In FY18, NRFSN products and activities continued to promote dialogue and deliver science on critical fire and fuels issues in the Northern Rockies, including fuel treatment effects, post-fire regeneration and re-burn potential, whitebark pine restoration, mountain big sagebrush, fire & traditional knowledge, and wilderness fire. In addition, we added a new emphasis on the human factors of firefighter safety, developing two staff ride pages, a research brief on radio communications, an organizational learning online hot topic, and making numerous relevant additions to our publication and webinar databases. In FY18, we partnered with advisory board member Kim Kelly and collaborators Frank Lake, Jim Durglo, Tony Harwood, and Monique Wynecoop to better understand and serve the needs of tribal fire and fuels managers, especially around traditional knowledge. This included an invited panel member at the 2018 Cohesive Strategy Workshop (Reno, Nevada), a presentation at the Northwest Bureau of Indian Affairs Regional Fuels meeting (Pendleton, Oregon), a visit to Confederated Salish-Kootenai tribal council meeting and a presentation at a Salish-Kootenai Forestry Club meeting (Pablo, Montana). 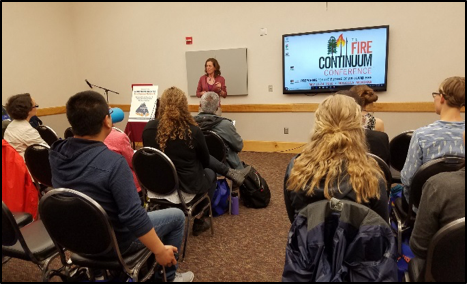 The Fire Continuum Conference was the largest event we participated in this past year, due to the variety of events offered and the large number of participants. We engaged with participants through presentations, a display table, field trips, a workshop, a photography exhibit, and overall event planning. Our products from this conference will include proceedings field trip summaries, plenary session recordings, and on-line resources and summaries associated with the field trips and workshop. 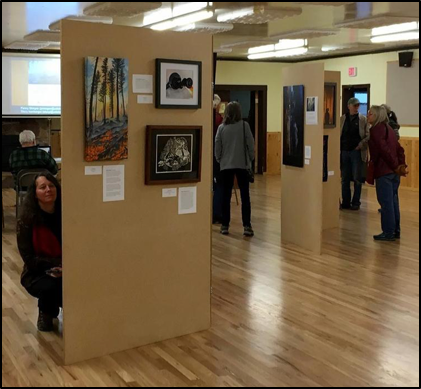 We co-sponsored several art events that engaged fire managers, scientists, and the public in conversations about fire. The three-day photography exhibit by wildland fire photographer Kari Greer, Facing the Inferno, offered managers, scientists, and students attending the Fire Continuum Conference the opportunity to view her spectacular images of firefighting and extreme fire events, and attend a reception where they could ask questions and discuss Greer’s work. In addition, the Conversations through the Smoke events in Idaho and Montana used art to spark conversations in communities that will continue to experience large fires and smoke. NRFSN support and sponsorship was critical to making these events a reality. We also participated in a series of conference calls to initiate a Wyoming Prescribed Fire Council, coordinated by Mike Johnston, Deputy Fire Staff Officer on the Bridger-Teton National Forest. A draft mission statement and by-laws have been developed and the first in-person meeting is planned for December 2019. SRFSN and GPFSN are also engaged as parts of Wyoming are included in all 3 networks. NRFSN will not attend the in-person meeting but will stay involved to the extent possible, and apply any learning from this process to Montana or Idaho PFC initiation if there is enough grassroots interest in these states. Our Advisory Board is very supportive and engaged, and we are looking forward to increased diversity and interaction with three new members representing BIA, BLM, and Montana DNRC. We had a productive in-person meeting this year which addressed defining success and measuring effectiveness, emergent management needs, and leveraging partnerships. Board members communicated their strong support of NRFSN’s role in disseminating science to managers through a variety of activities, resources, and products, and highlighted some areas where increased emphasis would be helpful to managers. They agreed with our current areas of emphasis and were especially interested in social science related to improving communication with the public and safety and risk management. Transition to FY19. Although we are not planning to host as many workshops and field trips as we did in FY18, we will continue disseminating science around key themes that are important to fire and fuels managers in the Northern Rockies. FY19 highlights include hosting the Western Region’s Cohesive Strategy Committee for a field trip during their annual in-person meeting. This field trip, co-organized with Sharon Hood, RMRS Fire, Fuels and Smoke Program, will take place at the Lick Creek Demonstration-Research Forest and focus on new findings from a JFSP-funded research project that assessed 25-year-effects of burning and cutting restoration treatments The study embraced virtually the full suite of possible treatment combinations that managers of ponderosa pine forests in this region employ, and ties in nicely with the Cohesive Strategy goals of Resilient Landscapes, Fire Adapted Communities, Safe, Effective, Risk-Based Wildland Fire Response. In addition, we are partnering with Yellowstone National Park and scientists Monica Turner (University of Wisconsin) and Brian Harvey (University of Washington) to host a field trip to the 2016 Maple fire, which burned in the footprint of the 1988 fires. The field trip will focus on Long-Duration Fire and Re-Burn Effects in Yellowstone National Park; we are partnering with the Rocky Mountain Ranger District of the Helena-Lewis and Clark National Forest to host a wilderness fire workshop during summer 2019; we are partnering with the Salish-Kootenai College and the Whitebark Pine Ecosystem Foundation to host a whitebark pine science and management workshop in Polson, Montana in September 2019; and we are partnering with the Crown [of the Continent] Managers Partnership to host our first event in British Columbia, Dispelling the Myths of Wildfire in the Crown in March 2019. We are also hosting two additional Conversations through the Smoke art shows and discussions in Moscow and Salmon, Idaho. Also in FY19, we will continue to expand our searchable database and website to include topic-focused “hot topic” web pages, which will feature new and important resources (webinar recordings, videos, scientific articles, reviews, and briefs) that inform specific issues. Featured topics will likely include post-fire salvage logging and public perspectives on fire management. In addition, we will be developing a video about managing wilderness fire for line officers and agency administrators. During our spring Advisory Board meeting, the Board recommended a needs assessment to help prioritize future topics and activities. We will be conducting a survey of NRFSN members who are federal land managers in November 2018. The NRFSN is one of five Fire Science Exchange Networks submitting a renewal proposal by February 1, 2019. Results of the needs assessment will inform the renewal proposal and the proposal will be submitted for funding our program of work in FY20-FY21. If you are interested in past reports, these are available: FY 2017, FY 2016, FY 2015, FY 2014.